I like this book a lot and I think you will like it too. I think you should get it and read it. That’s my review, really. The rest is mostly expansion of opinion, a little background explanation, and perhaps my now-traditional flight of fancy. So, if all that doesn't appeal to you, just stop here and go and get the book. I am fairly confident that you will race through it, enjoy it, be quite moved by it, and not be one bit mad at me for sending you its way. Still here? That’s nice. Stay another while then, and let’s talk this thing through a bit more. ‘The Death House’ is written in a deceptively simple style. The prose of the book sits back to let the story propel you through. It’s the kind of simplicity that a writer usually only attains after writing hard for many years. It’s the kind of simplicity that you have to struggle through every complication in the world to get to. It's the kind of thing that naive writers think they can do themselves anytime but they can’t. This is where many reviews give you a synopsis of what happens in the book. Why? I guess it raises the word count of the review to acceptable levels. You don’t need me to tell you what happens. Go and read it and you’ll find out. Sarah has written lots of books and I’ve enjoyed them but I’ve never been moved to write a page about any of them before. This is not to criticise them, Sarah’s always been a very fine writer. It’s just that this one is a step up, albeit from an already elevated position, to a whole other level altogether. I think this book puts Sarah up with the Kings and the Gaimans of the literary world. I think it has the potential to become a classic, a long standing favourite, a gem. Maybe it’s just me. You see I’m a sucker for three particular things in writing. Heart, Soul, Blood. When I writer puts these things into their work, I reckon I can feel it, way out here on the other side of the deal. I think Sarah has invested quite an amount of herself in this story. Not obvious biographical stuff, not that. I mean the more important stuff that drives us and makes us what we are. I don’t even think that writing about this stuff is necessarily a conscious thing. I think it’s an innate freedom which comes when there is a trust in the material. A comfort zone that enables the writer to open up subliminally and tell us about those things that really matter. This is where the book is strongest, I reckon, in the things it doesn’t overtly say. Things about the importance of love and the defences we erect to enable us to survive when it is gone. Things about the drive to protect the ones we are ordained to protect and the pain that comes when, finally, there is no more protection you can give. But, apart from all that stuff, this is also a cracking yarn for young adults and old adults alike. I predict you will read it in a sitting or two, if you can find the space, because the story has that juggernaut drive that carries you along keenly, breathlessly skipping words to see what will happen next. Sarah has been a valued Twitter Friend of mine for some time now. My Twitter Friends, for me, are no less friends than any other type of friend and, truth be told, are actually more like friends in some ways. We Twitter Friends mostly haven’t ever met and may never do so, I won’t be trying to borrow money off them or looking to sleep on their couch or anything like that. But, yet, we’ve borne witness to certain aspects of each others lives, as the years have slipped along, and these things count for something, for sure. But I’m not writing this review because I feel some obligation to a Twitter Friend. God knows, there would have to be many more reviews if I ever felt the need to do that. No sir. This is a great book and if I had never exchanged a social media sentence with her, I would still be commending Sarah's book to you in just the same way. On reflection, perhaps those friendships which gently evolve on social media are not dissimilar to the relationships which the characters forge in ‘The Death House’. We too are a diverse bunch who are thrown together in a strange place. Family and real life friends do not really enter into the equation and tiny events can often seem heightened and earth shattering. Both worlds, at times, can also seem false and restrictive and as if they ultimately can only lead to nothing good. But still we watch out for each other, the social media friends, we delight in our little successes and we place a virtual hand on a virtual shoulder in times of advancing dusk. See? I warned you that there might be a flight of fancy at the end, didn’t I? 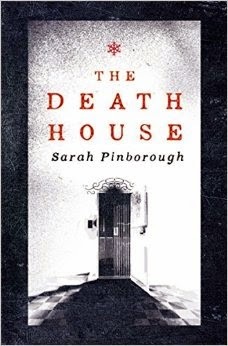 Sarah Pinborough has stepped right up towards the top of the hill with her new book The Death House. I can’t wait to see where she might go to next. I never read Kazuo Ishiguro’s novel Never Let Me Go (although I did see the film) but from what I’ve read on Amazon about The Death House I can imagine they might be cousins. Sarah talks about the book on the Gollancz blog here. She describes it as dystopian fiction—and Ishiguro’s novel is similarly labelled—but there’s been so much written especially in recent years and for younger readers that the term’s less helpful than it used to be. I’m sure there will be people living in alternate realities who would consider the world you and I find ourselves in a dystopia and it probably is. In the 1930s H.G. Wells came up with an outline for what would become the film Things to Come. In it he imagined a biological weapon called the "wandering sickness" a plague so virulent that the infected are shot on sight; no questions asked; no guilt felt. And now we have a TV show called The Walking Dead and it really isn’t a million miles away from what Wells imagined. Would any kid born into either world talk about it as a dystopia? Or would their fiction conceive something still more horrible? In 1989 DC comics trademarked the “Elseworlds” name and over the years they’ve published dozens of alternate takes on their stable of heroes like Superman: Red Son in which Kal-L's rocket crash-lands in Ukraine, and the Man of Steel becomes the USSR's main hero. I like these Sliding Doors kinds of stories and I get the feeling that this is what The Death House is going to be. A What if…? What If was Marvel’s version of Elseworlds. What would happen if children with a genetic likelihood of disease were sent away to a remote nursing home to die? What would that world be like? Is it any more horrible than breeding clones to use a body parts? It wasn’t that long ago that we used to kidnap people from Africa and treat them as slaves. It was perfectly normal. Was that a dystopia? I’ve bought the book. No idea when I’ll get round to reading it since I’m up to my armpits in editing my next novel but I will get round to it; you’ve piqued my interest with your non-review. I can’t tell you how often I’ve wished I could get away with something like this. In the olden—pre-dystopian?—days we’d meet for a coffee and just before you were about to leave you’d go, “Hang on a sec. Before I forget. Read this book last week. Don’t want to say any more. Just trust me. You’ll love it.” At which point you’d haul a paperback out of your backpack or jacket or Tesco carrier bag and toss it to me. “Let me know what you think.” That never happens nowadays. It really is a peculiar world we find ourselves in. It’s like friends. How can you possibly be friends with a woman with whom you’ve only tweeted? I can just imagine what the likes of Nancy Mitford or Evelyn Waugh, Henry Miller and Anaïs Nin—some of the great letter writers of the last century—would think about Twitter: a world where communication is restricted to blocks of texts not exceeding 140 characters—truly dystopian. I'm always glad to have a book recommended to me and Sarah's "The Death House" sounds as if it will be just up my street. Will Kindle it now. Thank you, Ken, for the recommendation and thank you, Sarah for penning it!